We inherited an interesting and wonderful collages collection (some hundred) from NERINA COCCHI ZECCHINI. Tailor and artist of the 20-th century (Bologna 1903 - Perugia 1999), Nerina began to create her collages works as a sexagenarian and her first success as an artist came when, over eighty, she was invited by Derna Querèl to exhibit in the famous Feluca Gallery of Rome in via Frattina, in 1987. She received a lot of favourable criticisms by different newspapers and TV, and sold numerous collages. After two years, in 1989, she obtained the same success of public and media in the Galleria d’Arte d’Azeglio in the old center of her native town Bologna, and even at age of ninety-one, i.e. in 1994, she attended with some works in a Survey Exhibition of Modern Art, “Rassegna d’Arte Contemporanea” in Umbria. The collages of Nerina Cocchi-Zecchini represent her sensibility to colours, the transposition of childhood’s tale elements on a figurative level with a naïve taste free from any model, the pleasure of a joke, so unexpected for someone her age. The fascination with newspaper fragments exploded in her fingers with astonishing results. Some unprofessional reproductions of collages are attached. We are ready to cooperate for the success of this proposal. We would be most happy to receive the donation of these works of Nerina Cocchi-Zecchini. If you decide to contribute a significant number of these works to the Museum we will arrange an exhibition of the works and produce a color catalog as well as create a website in her honor so that the works may be available for view via the internet. Any additional information about the artist, her history, photographs of her and family (even from childhood) and any other documents, ephemera, stories, known associations, etc. that will help us develop an archive for Nerina would also be helpful. Thank you for your prompt positive reaction and we answer immediately to continue our dialogue. We are especially pleased to discover that the few elements that we provide you with, seem already satisfy your request for arranging an exhibition, catalog, and so on!? In any case we take the opportunity of this email to send you some other (unprofessional) photos. Many Nerina’s works are spread in different European private homes, including ours. We would like to preserve as a unique entity the donation of all the remaining works that Nerina left us, some hundred, as we wrote. We imagine to carry ourself the heavy boxing bag to the final destination, and we would like to have some indication about where it will be. Meanwhile we are charged with the preparation of the additional information and materials for a possible archive. Those additional works that you sent are very interesting. I have a number of works by contemporary collage artists working along a similar track in relation to the ideas and construction methods of the works of Nerina. There is also something of a relationship to a well known American collage artist by the name of Romare Bearden. I am not sure if you understand the nature of the Collage Museum. I am the founding director of the museum and basically its only employee - an unpaid volunteer! I am, myself a practicing artist (http://touchon.com).I started the collage museum in 1998 primarily as an online museum of contemporary collage art with the idea of inviting artists to participate by contibuting works to the museum's collection which I then document and place the images of the works on the website with contact information for the artists. As the collection has grown, I mount exhibitions of works in the collection around trends I see happening in the works that artists send or I shape exhibitions around a theme and invite artists to contribute works for the exhibit which then become part of the collection. All of these exhibitions are held in other locations such as other art museums, university galleries and contemporary art centers because the museum, so far, is primarily an archive of works that are kept in storage and brought out only for exhibitions. The materials in collage art is delicate and sensitive to light so everything is kept in the dark to preserve it for the long term. Otherwise the works are always accessible on the website or through our catalogs. These can be seen at http://lulu.com/ontological. The idea of the museum is to create a collection that is gathered together like a scientific museum that collects rocks or bugs or perhaps like an anthropological museum. It is a cultural record of contemporary art that is unique, in that it is not based on artists being famous or based on the collections of wealthy collectors like most art museums are. It is an artist oriented museum developed around living connections to artists who work in this genre. These sort of artists are interesting in that most of them are not particularly interested in being professional artists although many are. So most are 'undiscovered'. But my idea is to penetrate into that underground world of many thousands of relatively isolated artists who find a common connection through collage/assemblage art and to invite them to contribute works for this archive being held for a future physical museum. First a collection is developed, and then later a place to keep it and exhibit it. So the museum is now to the point that several hundred works are coming into the collection every year and the collection contains around 10,000 works all kept in storage and used for exhibitions. The current state of things is to begin designing traveling exhibitions of the works and to develop a plan for a work of architecture that suits and reflects the nature of the collection. So it is a long range project but is now to the point that it is time to figure out how to create the physical structure for the museum. I like to say that I think in Museum Time which is over decades and centuries rather than months and years. In this project there is not only the collage museum but also the fluxmuseum at http://fluxmuseum.org which is also a related museum that I founded to document certain contemporary artists who also work in collage and assemblage but also poetry and conceptual art. Also there is a building collection of 20th century snapshot photography currently containing several thousand photographs. All of this is to say that, while the museum is very dynamic with lots of activity, I don't want you to be disappointed to find that there is not yet a big fancy museum building with many employees like a typical well established museum. This museum is still a baby but then so were all museums when they first started. I just wanted to make sure that you understand this. The advantage is, that the museum is completely focused on the artists involved and attempts to work toward the benefit of all artists working in this genre in an inclusive and open way. I do not turn away work from any artists who wished to contribute to the collection if their work is collage or assemblage or otherwise fits into the long term mission of the museum. The intention is to nurture and promote this community. I believe Nerina's work fits perfectly into this collection and would be an important addition. I hope to continue our conversation. Thank you for your personal introduction which corresponds in an incredible way to our expectation. Let us express our congratulations for the far-seeing of your initiative and we wish you the best success for your project. We had already taken the opportunity through the network to admire and appreciate your artistic works. The decision to participate in your enterprise is already taken! Before providing you with Nerina’s collages we need take better pictures of each work and to arrange their presentation with light paper-frame, in order to protect them. In addition we need to spend some time in preparing all information suitable to introduce the artist. Let us start this adventure! We expect from you the address where we have to send this big-sized parcel. That sounds exciting. I will be watching for your package. Is Oriano the name of the constellation as in English Orion? If so, that is my middle name: Orion. the package was sent this morning from Agello’s post office: 17350 g. of collage!!! And you may see the package on the table before departure. We expect that it will be in Fort Worth in less than 10 days. We are anxious to know the moment when it will be in your hands. As far as Orion is concerned we are very pleased that Orion and Oriano have an evident connection! We know the constellation but it has nothing to do with Oriano: this name was proposed to Oriano’s parents by an aunt which was a fan of the Italian writer Alfredo Oriani. Oriano is not a very common name in Italy, but even not so rare; there was also a Bishop Oriano in Puglia in the period 1022-1028. I will let you know as soon as the package arrives. 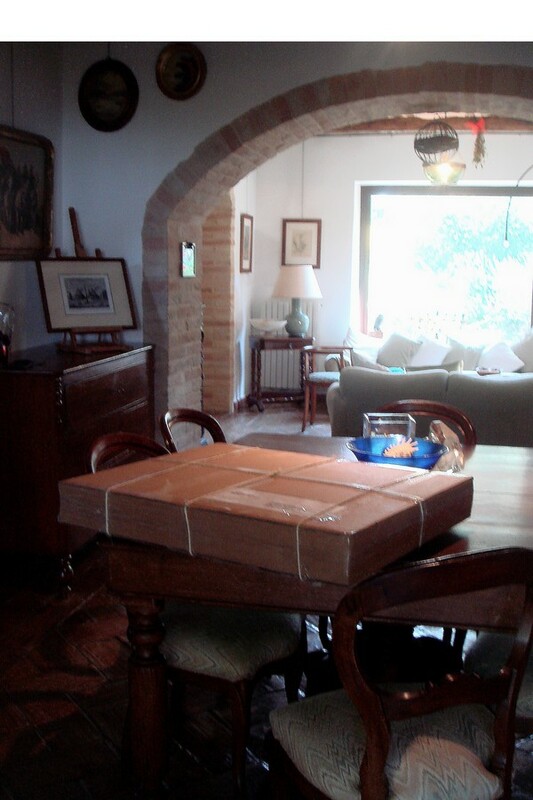 the package was sent on Tue, Jul 6, 2010 from Agello' post office, as we wrote, but it has not leaved Italy yet!! The Customs Dept. is raising difficulties about the need of an official positive statement of the Italian Administration competent for art and culture. It takes a lot of time to overcome these difficulties, but we hope to succeed and we will let you know when!! We need to be patient! I was wondering because I just received a package from Italy but is was a contribution from the wife of another artist - Alessandro Munari. She wished to send one of his works to the Collage Museum for his birthday because he has always wanted to send something but never does! So that was very sweet of her I think. The package of Nerina's works arrived yesterday. I have been going through them. Unfortunately a number of the larger works were damaged from the corners being crushed during shipping but only on the outer paper. The actual art is in good condition. I have set up the beginnings of a website here: http://nerinacocchizecchini.org. As there are 172 works it will take quite a while to photograph and document everything. In the meantime I am hoping that you could send me the digital images of the photos that you sent as prints. That will be better than trying to scan the printed photos. This might include any photos of Nerina that you have in digital format and of the Telecommunications document as a whole book before it was separated into individual pages. All of these are mounted on a cream paper. Is that an archival material? Is that the direct writing and signature of Nerina on these sheets? Also any additional memories of Nerina during her time as a collage artist would be helpful. Thank you for this wonderful contribution. There are a large number of very interesting works that I am sure will inspire many people. Thank you very much for the awaited announcement and for the photo of the package, so different from the one we sent! But we are very happy to know that the actual art is in good condition (sufficiently protected!). We are astonished and grateful for your immediate action in order to set up a very impressive website! We noticed also the italian version, on which we could be helpful if you agree. No digital photo existed in the 20th century, but we are scanning the analogic photos and we will send them (the Telecommunications document included, as Nerina left it) recorded on a standard CD (due to the low speed of our Internet connection). We mounted all the collages on cream paper to protect and present them in a proper way; the year is an estimated figure and the signature has been always put by me, also during Nerina’s time (some collages have such a signature)!! The information about the mounting and signing of the work solves several mysteries for me. I could tell that they were all mounted at the same time and on a paper what was not available during your mother's lifetime. My wife Rosalia assumed that you had signed these works. I am also happy to know that these were all mounted and oriented by you after the fact which allows me to speculate that Nerina herself did not make these choices and allows me to more carefully consider the orientation of the works. I have already determined that some seem to have been constructed and intended to be viewed from a different orientation than as they are currently presented. It is clear that some are landscapes and that some are abstract images - or seem to be - but there are others that I am having difficulty understanding what they are intended to be or the reasoning behind their compositions. I am hoping that you will be able to help me decipher some of these works or remember what you mother might have said or explained about them. For instance, did she normally title her works? Also, did she keep any sort of notes or a diary? Additionally, I notice that there are a number of these works that are intended to be a mirror image or a reflection. There are also some that share a similar form of construction and style and may have been made sequentially. I am thinking of the ones where she tore the paper rather than cut it. I find it interesting that she very often used a similar pointed, irregular form as her constructive 'unit' for a majority of the works. Then of course there are the completely unique experiments that are outside of her usual method and style. Aside from this collection of 172 collages that you have contributed to the museum, how many additional works would you guess that she made during her career as a collage artist? Do you have photographs of those which are not currently in your possession and are owned by others? Another question has to do with her market. How many of her works were sold through galleries and approximately how much did they typically sell for at that time? All of these details help to shape the picture of her life and naturally, anyone who takes an interest in her work and life will wish to know these things as it helps in the understanding of her work. Therefore, I will need to be as expert as possible in understanding her work and life as it applies to the artworks now in the museum's collection. As I understand from the materials included, she had two one-person shows in her lifetime and exhibited in the mid 1990's in the Rassegna d'Arte Contemporanea in Agello, Umbria. Was this the full extent of her exhibition history? Were there any other individual or group exhibitions? We will want to make a time line. Yes, once most of the content has been added to the site, I will be very happy for you to edit the Italian version of the site. Currently it is merely a google translation. But I wanted to be sure that your mother shows up in Italian language searches for collage art and artists. There are a great many Italian collage artists! I am sorry to put you through this additional work. I am proceeding on the assumption that you wish to help make her work known and remembered. I will be slowly working out a strategy to have Nerina's work exhibited as often as opportunity arises and include it in future group exhibitions to continue to develop an exhibition history for her work. Abbiamo ereditato una collezione interessante e meraviglioso collage (un centinaio) da NERINA COCCHI Zecchini. Tailor e artista del secolo 20-esimo (Bologna 1903 - Perugia 1999), Nerina ha cominciato a creare il suo collage funziona come un sessantenne e il suo primo successo come artista è stato quando, più di ottant'anni, è stata invitata da Derna Quérel ad esporre nel Feluca celebre Galleria di Roma in via Frattina, nel 1987. Ha ricevuto un sacco di critiche favorevoli da diversi giornali e TV, e venduto numerosi collage. Dopo due anni, nel 1989, ha ottenuto lo stesso successo di pubblico e media in Galleria d'Arte d'Azeglio, nel centro storico della sua città natale Bologna, e anche all'età di novanta-uno, cioè nel 1994, ha frequentato con alcune opere in una mostra Survey of Modern Art, "Rassegna d'Arte Contemporanea" in Umbria. Il collage di Nerina Cocchi-Zecchini rappresentare la sua sensibilità ai colori, la trasposizione di elementi racconto dell'infanzia a livello figurativo, con un gusto naif libero da ogni modello, il piacere di una battuta, in modo inaspettato per una persona della sua età. Il fascino con frammenti di giornale è esplosa tra le dita con risultati sorprendenti. Alcune riproduzioni di collages non professionale sono allegati. Siamo pronti a collaborare per il successo di questa proposta. Ci sarebbe molto felice di ricevere la donazione di queste opere di Nerina Cocchi-Zecchini. Se si decide di contribuire un numero significativo di queste opere al Museo the faremmo un 'esposizione delle opere e produce un catalogo di colore e di creare uno honor suo website in modo che le opere possono essere disponibili per view via Internet. Eventuali informazioni aggiuntive circa l'artista, la sua storia, delle sue fotografie e la famiglia (anche da bambino) e di altri documenti, Ephemera, storie, associazioni note, ecc, che ci aiuterà a sviluppare un archivio per Nerina sarebbe anche utile. Grazie mille per aver contattato me. Sono ansioso di sentire da voi! Grazie per la pronta reazione positiva e noi risponderemo immediatamente per continuare il nostro dialogo. Siamo particolarmente lieti di scoprire che i pochi elementi che vi mettiamo a disposizione, sembrano già soddisfare la Sua richiesta per l'organizzazione di una mostra, il catalogo, e così via!? In ogni caso cogliamo l'occasione di questa email per l'invio di qualche altro (non professionale) le foto. Molti Nerina opere sono sparse in diverse case europee private, compreso il nostro. Vorremmo mantenere, di un soggetto unico della donazione di tutte le opere rimanenti che Nerina ci ha lasciato, qualche centinaio, come abbiamo scritto. Ci immaginiamo noi stessi ad effettuare il sacco pesante boxe alla destinazione finale, e ci piacerebbe avere qualche indicazione su dove sarà. Nel frattempo ci pagano con la preparazione delle ulteriori informazioni e materiali per un archivio possibile. Tali lavori inviati sono molto interessanti. Ho un certo numero di opere di artisti contemporanei collage di lavoro lungo una pista simile in relazione alle idee e metodi di costruzione delle opere di Nerina. Vi è anche qualcosa di un rapporto con un noto artista del collage americano con il nome di Romare Bearden. Non so se si comprende la natura del Museo Collage. Io sono il direttore e fondatore del museo e in fondo il suo dipendente solo - un volontario non retribuito! Io sono, io stesso un artista praticante (http://touchon.com). Ho iniziato il museo collage nel 1998 principalmente come un museo on-line di arte contemporanea collage con l'idea di invitare gli artisti a partecipare esista, lavora per la raccolta del museo che ho documento e poi posto le immagini delle opere sul sito web con informazioni di contatto per gli artisti. Come la collezione è cresciuta, a montare mostre di opere della collezione intorno tendenze che vediamo accadere nelle opere che gli artisti inviare o io forma mostre intorno un tema e invitare gli artisti a contribuire opere per la mostra che diventano parte della collezione. Tutte queste mostre si tengono in luoghi altri, come altri musei d'arte, gallerie university e centri d'arte contemporanea del museo perché, finora, è principalmente un archivio di opere che sono conservate in luogo e fatto uscire solo per mostre. I materiali in arte collage è delicato e sensibile alla luce quindi tutto è tenuto all'oscuro di preservarlo per il lungo termine. In caso contrario, le opere sono sempre accessibili sul sito o attraverso i nostri cataloghi. Questi possono essere visti in http://lulu.com/ontological. L'idea del museo è quello di creare una collezione che si raccoglie come un museo scientifico che raccoglie rocce o bug o forse come un museo antropologico. Si tratta di un record culturale di arte contemporanea che è unica, in quanto non è basato su artisti che sono famosi o alle collezioni di ricchi collezionisti come i musei d'arte sono più. Si tratta di un artista museo orientato sviluppato intorno connessioni vita ad artisti che lavorano in questo genere. Queste specie di artisti interessanti che la maggior parte di loro non sono particolarmente interessati ad essere artisti professionisti, anche se molti lo sono. Così la maggior parte sono 'scoperti'. Ma la mia idea è di penetrare in quel mondo sotterraneo di molte migliaia di artisti relativamente isolati che trovano uno connessione comune attraverso collage / assemblage d'arte e di invitarli a contribuire works di questo archivio è detenuto per un futuro physical museum. In primo luogo una collezione è sviluppata, e poi di un posto di custodirla e mostra. Così il museo è ora al punto che diverse centinaia di opere provenienti dalla collezione ogni anno e la collezione comprende circa 10.000 opere, tutte tenute in deposito e utilizzata per mostre. L'attuale stato di cose è di iniziare a progettare esposizioni itineranti delle opere e di sviluppare un piano per un lavoro di architettura che si adatta e riflette la natura della collezione. Quindi è un progetto a lungo raggio, ma è ora al punto che è giunto il momento di capire come creare la struttura fisica per il museo. Mi piace dire che credo in Museo tempo che è nei decenni e nei secoli, piuttosto che mesi e anni. In questo progetto non c'è solo il museo, ma anche il collage fluxmuseum a http://fluxmuseum.org che è anche un museo correlati che ho fondato a documentare alcuni artisti contemporanei che lavorano anche in collage e assemblaggio, ma anche poesia e l'arte concettuale. Inoltre vi è un edificio collezione di fotografia istantanea ventesimo secolo, attualmente di diverse migliaia di fotografie. Tutto questo per dire che, mentre il museo è molto dinamico, con molta attività, io non voglio che tu sia deluso per find che non esiste ancora un grande edificio museum fantasia con molti dipendenti come un museo tipico ben collaudato. Questo museo è ancora un bambino, ma poi lo erano anche tutti i musei quando hanno iniziato. Volevo solo fare in modo che lo capiate. Il vantaggio è che il museo è completamente focalizzata sugli artisti coinvolti e tenta di lavorare per il beneficio di tutti gli artisti che lavorano in questo genere in modo inclusivo e aperto. Non mi volto lontano dal lavoro degli artisti che hanno voluto contribuire alla raccolta, se il loro lavoro è collage o assemblaggio o altrimenti si inserisce nella missione a lungo termine del museo. L'intenzione è quella di coltivare e promuovere questa comunità. Credo che il lavoro Nerina si inserisce perfettamente in questa raccolta e sarebbe un'aggiunta importante. Spero di continuare la nostra conversazione. Grazie per la vostra introduzione personale che corrisponde in un modo incredibile alla nostra aspettativa. Esprimiamo le nostre congratulazioni per la lungimirante della vostra iniziativa e vi auguriamo il miglior successo per il progetto. Avevamo già colto l'occasione attraverso la rete di ammirare e apprezzare le vostre opere artistiche. La decisione di partecipare alla vostra azienda è già preso! Prima di fornire voi con collage di Nerina abbiamo bisogno di scattare foto migliori di ogni opera e di provvedere alla loro presentazione con la luce di carta-frame, al fine di proteggerli. Inoltre abbiamo bisogno di passare un po 'di tempo nella preparazione di tutte le informazioni adatte per introdurre l'artista. Cerchiamo di iniziare questa avventura! Ci aspettiamo da voi l'indirizzo a cui dobbiamo inviare questo pacco di grande formato. Che suona eccitante. Sarò a guardare per il proprio pacchetto. Oriano è il nome della costellazione di Orione come in inglese? Se è così, questo è il mio secondo nome: Orion. il pacchetto è stato inviato questa mattina da ufficio postale di Agello: 17.350 g. del collage! E potete vedere il pacchetto sul tavolo prima della partenza. Ci aspettiamo che sarà a Fort Worth in meno di 10 giorni. Siamo ansiosi di conoscere il momento in cui sarà nelle vostre mani. Per quanto riguarda la Orion riguarda siamo molto soddisfatti che la Orion e Oriano hanno una connessione evidente! Sappiamo che la costellazione, ma non ha nulla a che fare con Oriano: questo nome è stato proposto ai genitori Oriano da parte di una zia che era una fan dello scrittore italiano Alfredo Oriani. Oriano non è un nome molto comune in Italia, ma anche non così rara, c'era anche un Vescovo Oriano in Puglia nel periodo 1022-1028. Vi farò sapere al più presto il pacchetto arriva. il pacchetto è stato inviato il Mar, 6 luglio 2010 da ufficio postale Agello ', come abbiamo scritto, ma non ha ancora lasciato l'Italia! Il Dipartimento delle dogane è sollevare le difficoltà circa la necessità di una dichiarazione ufficiale positiva dell'Amministrazione competente italiano per l'arte e la cultura. Ci vuole un sacco di tempo a superare queste difficoltà, ma speriamo di avere successo e vi faremo sapere quando! Abbiamo bisogno di essere paziente! Mi chiedevo perché ho appena ricevuto un pacchetto da Italia, ma è stato un contributo della moglie di un altro artista - Alessandro Munari. Avrebbe voluto inviare una sua opera al Museo Collage per il suo compleanno, perché ha sempre voluto trasmettere qualcosa, ma non lo fa mai! Così che era molto dolce del suo credo. Il pacchetto di Nerina opere arrivato ieri. Mi è stato passare attraverso di loro. Purtroppo un certo numero di opere più grandi sono stati danneggiati dagli angoli schiacciamento durante la spedizione, ma solo sulla carta esterno. L'arte attuale è in buone condizioni. Ho costituito l'inizio di un sito web qui: http://nerinacocchizecchini.org. Come ci sono 172 opere ci vorrà un bel po 'di fotografare e di tutto ciò che di documento. Nel frattempo spero che potreste mandarmi le immagini digitali delle foto che hai inviato come stampe. Questo sarà meglio che provare ad analizzare le foto stampate. Ciò potrebbe includere tutte le foto di Nerina che avete in formato digitale e del documento di telecomunicazione come un intero libro, prima si è separato in singole pagine. Tutti questi sono montati su una carta color crema. È che un materiale d'archivio? È che la scrittura diretta e la firma del Nerina su questi fogli? Anche qualche ricordo supplementare di Nerina durante il suo tempo come un artista di collage sarebbe utile. Grazie per questo splendido contributo. Ci sono un gran numero di opere molto interessanti che sono certo ispirerà molte persone. La ringrazio molto per l'annuncio atteso e per la foto del pacchetto, così diversa da quella che avevamo inviato! Ma siamo molto felici di sapere che l'arte attuale è in buone condizioni (sufficientemente protetti!). Siamo stupiti e grati per il tuo intervento immediato al fine di creare un sito web molto impressionante! Abbiamo notato anche la versione italiana, su cui potrebbe essere utile se siete d'accordo. Nessuna foto digitale esistente nel 20 ° secolo, ma noi siamo la scansione della foto analogica e invieremo loro (compreso il documento di telecomunicazioni, come Nerina ha lasciato) registrati su un CD standard (a causa della bassa velocità della nostra connessione Internet). Abbiamo montato tutti i collage su carta crema per proteggere e presentarli in modo adeguato, l'anno è una figura stimata e la firma è stato sempre messo da me, anche durante la prima Nerina's (alcuni collages di avere un tale firma)! Le informazioni sul montaggio e la firma del lavoro risolve parecchi misteri per me. Potrei dire che erano tutti montati allo stesso tempo e su una carta che non era disponibile durante la vita di tua madre. Mia moglie Rosalia presume che avevano firmato questi lavori. Sono anche felice di sapere che questi erano tutti montati e orientata da voi dopo il fatto che mi permette di ipotizzare che la stessa Nerina non ha fatto queste scelte e mi permette di considerare più attentamente l'orientamento dei lavori. Ho già deciso che alcuni sembrano essere stati costruiti e destinati ad essere visti da un orientamento diverso da come sono oggi presentate. E 'chiaro che alcuni sono paesaggi e che alcuni sono immagini astratte - o sembrano - ma ci sono altri che sto avendo difficoltà a capire ciò che essi sono destinati ad essere o il ragionamento dietro le loro composizioni. Sto sperando che sarete in grado di aiutarmi a decifrare alcune di queste opere o di ricordare quello che la madre si potrebbe già detto o spiegato su di loro. Per esempio, ti ha titolo normalmente le sue opere? Inoltre, lei ha fatto mantenere qualsiasi tipo di appunti o un diario? Inoltre, ho notato che ci sono un certo numero di queste opere che sono destinate ad essere l'immagine speculare o di una riflessione. Ci sono anche alcuni che condividono una forma analoga di costruzione e di stile e potrebbero essere state fatte in sequenza. Penso a quelli in cui si strappò la carta piuttosto che tagliarla. Trovo interessante che lei molto spesso usato un simile a punta, come la sua forma irregolare costruttivo '«unità» per la maggior parte delle opere. Poi naturalmente ci sono gli esperimenti del tutto uniche che sono al di fuori del suo solito metodo e stile. Oltre a questa raccolta di 172 collages che avete contribuito al museo, come molte opere supplementari indovinate che ha fatto durante la sua carriera come artista di collage? Avete delle foto di quelle che attualmente non sono in vostro possesso e sono di proprietà di altri? Un'altra domanda ha a che fare con il suo mercato. Come molti dei suoi lavori sono stati venduti attraverso gallerie e circa quanto hanno in genere per vendere in quel momento? Tutti questi dettagli contribuiscono a formare lo foto della sua vita e, naturalmente, chi si interessa il suo lavoro e la vita vorrà sapere queste cose in quanto aiuta nella comprensione del suo lavoro. Pertanto, mi need to essere il più esperto possibile il suo lavoro nella comprensione and vita come essa si applica alle opere d'arte the ora nella collezione del museo. Mi pare di capire dal materiale incluso, aveva due mostre personali nella sua vita e esposta nella metà del 1990 nella Rassegna d'Arte Contemporanea di Agello, Umbria. Era questa la portata della sua storia mostra? Ci sono stati altri individui o mostre di gruppo? Noi vogliamo fare una linea del tempo. Sì, una volta la maggior parte del contenuto è stato aggiunto al sito, sarò molto felice per voi per modificare la versione italiana del sito. Attualmente è solo una traduzione di Google. Ma volevo essere sicuro che tua madre compare nelle ricerche di lingua italiana per l'arte del collage e gli artisti. Ci sono un grande collage di molti artisti italiani! Mi dispiace per mettere l'utente attraverso il lavoro aggiuntivo. Sono muove dal presupposto che si vuole contribuire a rendere la sua opera più conosciuta e ricordata. Io lentamente elaborando una strategia per avere un lavoro Nerina è esibita come spesso si pone come opportunità e includerlo in mostre collettive futuro per continuare a sviluppare una storia mostra per il suo lavoro.